2015 Toledo Pickleball Glass City Invitational Results – Pickleball is Thriving in Northwest Ohio! 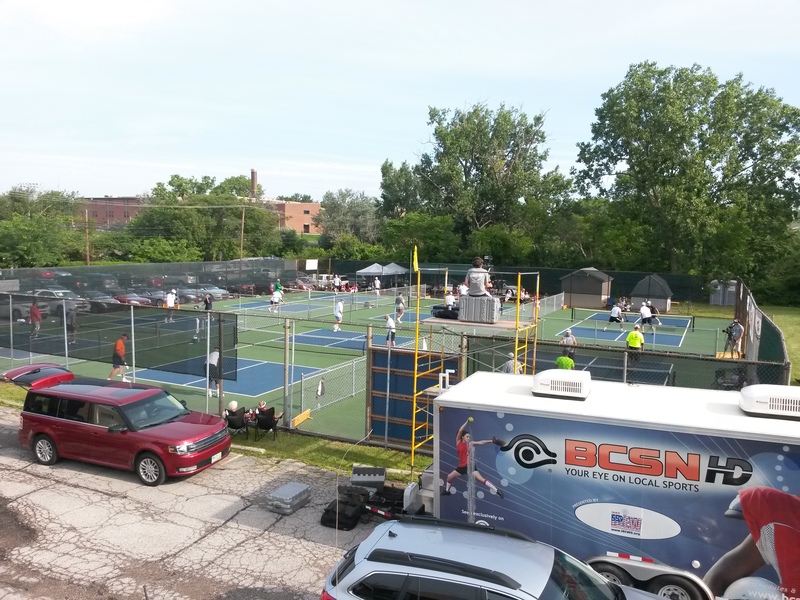 The 2015 Toledo Pickleball Glass City Invitational was hosted once again by the Toledo Pickleball Club near the end of July. Our event expanded from last year’s inaugural size of sixty players over two days to almost 90 players for this Friday through Sunday competition. Unlike last year, we had to battle the elements of a steady rain to start, high heat, two surprise thunderstorms (one w/high late night winds) and oppressive humidity. Despite the challenges, the matches finished all outdoors and all on time, save for the one mixed doubles finals that was rain interrupted on Saturday and finished up on Sunday morning. Jessica LeMire, USAPA National bronze medalist for the last two years, was our top ladies player as she captured the first place blue glass mug in both the 5.0 Mixed Doubles (with partner Dave Kovanda) and the 5.0 Ladies Doubles (with partner Bobbi Little). Bobbi also took home a second place rock glass award with Duane Hill in the 5.0 Mixed Doubles. Nancy Meyer captured three awards by winning the Ladies Singles and finishing third in the 5.0 Ladies Doubles (with partner Shannon Gallup) and third again in the 5.0 Mixed Doubles (with partner Charlie McKnight). Shannon also captured awards for second in the Ladies Singles and third in the 4.0 Mixed Doubles (with partner Tim Hacker). Anita Epperly finished second in both the 5.0 Ladies Doubles (with partner Mollie Miller) and the 4.0 Mixed Doubles (with partner Brian Yunker), in our only rain interrupted match. Sue Hickey took second in the 4.0 Ladies Doubles (with partner Vicki McGrath) and won the big blue first place glass mug (along with hubby, Bill Hickey) in the 4.0 Mixed Doubles. Pat Galvin captured several awards, including third place in the 3.5 Ladies Doubles (with partner Sandy Tiell and second place in the 3.0 division), second place in the 3.5 Mixed Doubles (with partner Dan Horvath) and third place in the Ladies Singles. Tournament Director, Connie Mierzejewski took third in the 3.0 Ladies Doubles (with partner Robyn Blosh) and second in the 3.0 Mixed Doubles (with partner Steve Poseler). Other local women who fared well in the tourney included: Liz Sepeda & Judy Lambert, who took third place in the 4.0 Ladies Doubles, Ac Miller who won the 3.0 Mixed Doubles (with partner Jerry Groce) and Lisa Yunker, who came in third in this same division (with partner Pete Maxwell). Also, Pat Pastorek took third place honors in the 3.5 Mixed Doubles (with partner Bob Lineen). On the men’s side, Charlie McKnight won the 4.5 Men’s Doubles (with partner Gary Ball) and also the Men’s Singles. Tim Hacker & Jeff Chantiny won all of their matches on their way to capturing the 4.0 Men’s Doubles honors, with the father-son team of Mike and Brian Yunker coming in third in this same division. Jerry Groce & Rick Potter won the 3.0 Men’s Doubles, while locals David Hamilton & Dan Horvath finished third in the same division. There are several other medalists not mentioned above that are listed in the results below. To see the individual match scores for each division, go to www.PickleBallTournaments.Com and look for our tourney results under “Tournaments”, then “Past Tournaments” and then click on the division you wish to see. We were very fortunate to have our four tournament shirt sponsors for this year’s event, which included the Rossford Convention and Visitors Bureau, Billy V’s, Richard L. DeVaul Tax Service, Attorneys Heban, Sommer & Murphree. Several businesses and individuals donated prizes for our raffles, including the Boilermakers Local 85. The players also enjoyed a sample of the “Sweet Hots” from our local, famous Tony Packo’s. Tournament director Connie Mierzejewski and her assistant Charlie McKnight worked hard to prepare for this second annual event. USAPA Tournament Schedule, Results & Points liaison, Marilyn Holiday, handled the court assignments and tourney results desk for the entire three day weekend. BCSN recorded a few of our matches on Sunday morning and Connie provided the color commentary. Many others contributed their time and efforts to make this event a success and we certainly appreciate it very much. All in all, it was an excellent second time event and it will only get better in the years to come. We look forward to next year’s event, with perhaps even more players from our local area and from out of town. This entry was posted in Tournament Results and tagged BCSN, jessica lemire, Ohio, Pickleball Tournament, toledo pickleball, Toledo Pickleball Glass City Invitational. Bookmark the permalink.